An Avalanche is fast-approaching 2018-19’s NHL season, straight from Colorado! The Colorado Avalanche have an all-new lineup and the rigor to prove themselves this year. Critics and hockey fans alike consider this a promising readjustment and are enthused about their back-to-back pre-season games with rivals Minnesota Wild. Get a hold of Colorado Avalanche tickets for a chance to witness exciting contests, and many more as well. First Stanley Cup Win 1996 – Everyone was expecting the Colorado Avalanche to put on a stellar performance in the 1996 Stanley Cup Finals at the McNichols Sports Arena and the Miami Arena. However, no one was expecting them to completely sweep the Florida Panthers. The Avs entered the finals series with a ferocity never seen before by a team that had just relocated. Patrick Roy went toe-to-toe with Florida Panthers’ goalie John Vanbiesbrouck throughout the series. Vanbiesbrouk stopped a hundred and ten shots from Roy. Uwe Krupp’s Stanley Cup clinching goal in the third overtime of the last game became the deciding factor in the end. Gaining a Franchise 1995 –The defining moment in Avalanche’s history was when the Quebec Nordiques headed over to Denver, Colorado. By 1995, the Nordiques were a franchise that had seen their share of ups and downs. They had the experience which Denver lacked at the time and Denver, in turn, would give the fresh start they desperately needed. A perfect match was struck and the Colorado Avalanche was founded. A later trade with the Philadelphia Flyers gained the new team Mike Ricci and Peter Forsberg, solidifying their lineup even further. New Stadium 1999 – In the October of 1999, the Pepsi Center opened in Denver, Colorado. It became the Colorado Avalanche’s new home even though the center hosts many other events as well. The state-of-the-art arena has been renovated many times since and is a great place to enjoy some of the best ice hockey games in the US. Detroit Red Wings Detroit and Colorado first met in the Western Conference Finals in 1996 where the Avalanche was the underdogs. The Avs however, began on a high point and won the first two games. While Detroit defeated them in the next two games, the Avalanches won game six and advanced to the finals. Along with this neck-to-neck competition, Avalanche’s Claude Lemieux started the most intense rivalry of modern ice hockey after he smashed Kris Draper’s face into the side railings. The Red Wings have not forgiven this intentional hit and the two teams have had frequent brawls during their games ever since. Their most notable brawl took place on March 26,, 1997, when the game had to be stopped altogether because too many fights were taking place on the rink. Minnesota Wild – During the 2013-14 season, the Colorado Detroit rivalry was more or less non-existent. However, the Minnesota Wild filled this spot after the Avalanche beat them 4-1. The rivalry became physical especially after Minnesota’s Matt Cooke took down Tyson Barrie. Initially a part of the Quebec Nordiques, Valeri Kamensky is from the original Avalanche lineup. Adding 66 playoff points for the Avs, Kamensky scored 261 regular points for the franchise. The Avalanche’s first Stanley Cup was mainly due to the efforts of Kamensky’s 28-point streak in the decisive game. Uwe Krupp too is immortalized in Colorado history because of his winning goal at the Avs first Stanley Cup win. His final shot gave the Avs a 4-0 series victory over the Florida Panthers. Claude Lemieux is a hero amongst Avalanche fans because of his animosity towards the Detroit Red Wings. Lemieux’s contributions also extend to the scoreboard. Scoring 267 regular points, Lemieux was the Avalanche’s ultimate defense in the rink— protecting key players from opponents, even if it meant getting physical or putting himself in harm’s way. The Colorado Avalanche share the Pepsi Center with the Denver Nuggets. Inside the arena, you'll find some of the most loyal and knowledgeable hockey fans in the league. These fans come out and cheer their team on at any point throughout the year. Be a part of the excitement with NHL Preseason tickets. Fans can also a great culinary experience at the Land Rover Denver Club and the Peak Pub House. With two pre-season games lined up against the Minnesota Wild, there’s only one question on everyone’s mind, When do Colorado Avalanche tickets go on sale? The answer is Right Here! Right Now! Our process for purchasing cheap Colorado Avalanche tickets is simple and fast. There are so many online ticketing sites, that it can be hard for customers to find the right place to buy Colorado Avalanche tickets at the cheapest price. At ScoreBig we think of our customers first and foremost. We offer daily deals for Colorado Avalanche events, so our customers can get the best seats for the best prices. ScoreBig will always go above and beyond to offer the cheapest Colorado Avalanche tickets on the market. The Colorado Avalanche schedule above, displays all available events for 2019 and 2020. Once you find the event that you would like to go to, click the red “Get Tickets” button. It is located on the right-hand side of the event listing, it will take you to an Colorado Avalanche event ticket page. ScoreBig's event ticket page will display all available Colorado Avalanche tickets for that event. On the event ticket page to help with your search for the right Colorado Avalanche tickets, use the filters at the top to select quantity, price range, and more. There is also an interactive seating chart so you can pick where you want to sit. When you are ready to buy a ticket, click on the listing, and you will be directed to ScoreBig's checkout page. Upon completion of the information fields, your order will be processed and your Colorado Avalanche tickets will be delivered via email, mail, or to your mobile device. What makes ScoreBig’s site stand out from the rest? We are constantly analyzing our competitors to improve our site, service, and prices. ScoreBig.com employees strive to offer the best process and experience to buy cheap Colorado Avalanche tickets. Our goal is to get you the best seats to Colorado Avalanche events. We offer daily discounts on our site and for special promotions check out our newsletter. If there are no Colorado Avalanche events currently available, you can use our search feature at the top of the page to see a list of all popular events going on near you. No matter your price point, we have all the best deals and discounts on Colorado Avalanche tickets. For more information on prices of Colorado Avalanche tickets and the schedule for Colorado Avalanche, check out our listings above. The last thing you want to find out is when the Colorado Avalanche event you wanted to go to is sold-out. Don’t worry in many cases ScoreBig has affordable tickets to sold out events. We sell tickets from GA all the way to premium seating and parking. Skip the scalpers in the parking lot and get your tickets online from top Colorado Avalanche ticket brokers. We get you in all events, buy your Colorado Avalanche tickets here from a brand that many trust and rely on for all their ticketing needs. ScoreBig offers a 100% money-back guarantee. If you have been in search of cheap tickets for Colorado Avalanche, ScoreBig by far is the best option. That’s why ScoreBig has more loyal customers than any other ticketing site. 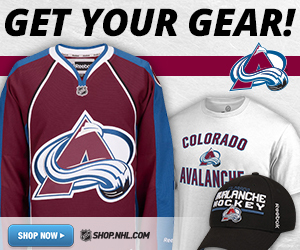 Shop at ScoreBig for safe and secure Colorado Avalanche event tickets.